The hiking trail is located at an altitude of approximately 1400 m with variations of a few hundred metres on the various stretches. The almost 80 km long high-alpine Merano Trail is definitely one of the most beautiful round hikes in South Tyrol. It leads through the Tessa Group Nature Park and can be done in 3-8 days (depending on your level of fitness and length of tour). Along the trail you will find alpine huts, rest places and accommodation (hotels in Merano). The huts are ideal to rest and to enjoy great food, take a break in case of bad weather, and even for overnight accommodation. 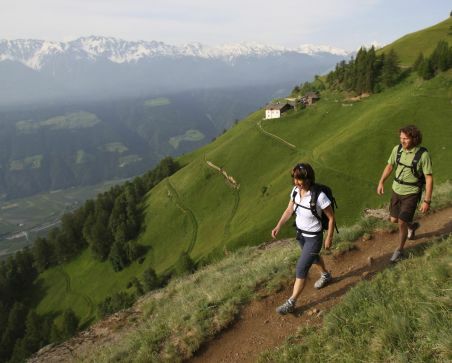 You can join the high-alpine Merano Trail at various places. In the southern part you have the possibility to hike down to the nearby villages in the Venosta Valley, Senales Valley, Merano & environs and in the Passiria Valley or you can take the villages as a starting point. You can take a break or leave during any part of your hike. You can take the bus back to your hotel from your chosen destination. The sunny southern part of the high-alpine trail is accessible from May to November. Villages and communities along the high-alpine Merano Trail include Senales, Naturno, Parcines, Lagundo, Merano, Tirolo, Caines, Riffiano, S. Martino, S. Leonardo and Moso. Due to the high-alpine character, the northern part of the trail is further away from the villages and is only recommended from June to September. It leads through Val di Fosse and Val di Plan, whereby the Gelato Pass (the highest point of the high-alpine Merano Trail at 2895 m) which divides the two valleys, has to be conquered. Other high peaks include: Altissima Mountain (3480 m), Cima Bianca Grande (3278 m) and Cima della Grava (3147 m). There are many interesting sights along the high-alpine Merano Trail. The famous glacier mummy Ötzi was found in the Tessa Group Nature Park at the bottom of the Similaun glacier in 1991. Worth seeing is the Parcines waterfall, the Sopranes lakes (10 alpine lakes at altitudes between 2117 m and 2589 m, which developed through the glaciers), numerous ancient castles and churches, like Juval Castle, the Prokulus Church in Naturno, which hint at the settlement history of the Burgraviato area, various aristocratic manors in the Passiria Valley, and the old town in Merano with its famous arbours.